VW Polo 2019 is one of the most popular and liked models of the German producer. 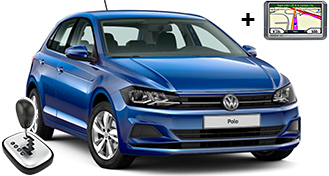 The brand new model of VW Polo 2019 is with built in GPS with amazing appearance, bigger sizes of the cabin and the trunk and automatic gearbox that makes it easy and pleasant for driving. VW Polo 2019 + NAVI is modern, fuel efficient and maneuverable car with beautiful design and many extras. The cabin is more spacious than the previous model which provides safe and pleasant transporting of up to 5 passengers. The fuel efficient engine combined with automatic gearbox and compact sizes make it perfect for driving at urban and non-urban conditions. VW Polo 2019 is perfect choice for rental car from the economy class.